A value-added service (VAS) is a popular telecommunications industry term for non-core services, or in short, all services beyond standard '''voice call'''s and '''fax''' transmissions. However, it can be used in any service industry, for services available at little or no cost, to promote their primary business. 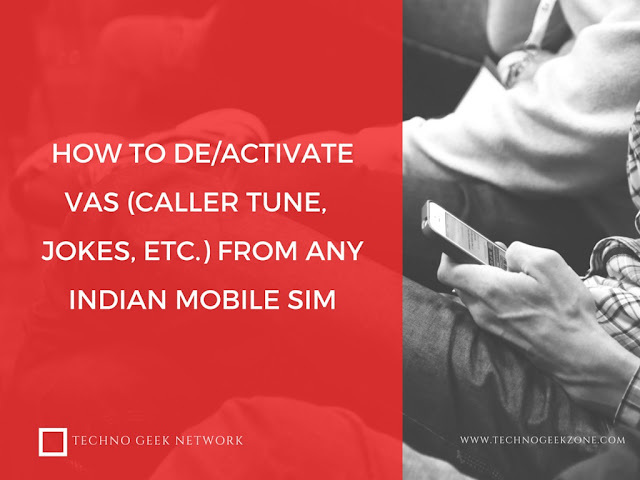 India’s Telecom regulator TRAI has mandated that for activation of mobile value added services, across types of scenarios – Outbound Dialer (OBD), Voice Portal (IVRS), WAP, Mobile Internet, USSD, SMS and Telecalling, or any other method – telecom operators need to provide a system which takes a second consent from the customer before it is enabled. It is a common complaint of a mobile user that telcompanies deduct balance from their account for a Value Added Services (VAS) which the consumer has not even subscribed. Sometime we get in the trap of telemarketers and subscribe to any services which may include Caller tune, Jokes, Astrology, etc. and this is a serious problem because it deducts our mobile balance. Here I am giving you a number which is applicable to any company SIM either Airtel, Vodafone, BSNL, Uninor, Aircel, Reliance, Idea etc. In India. You have to call on the above number 155223 and follow the given Voice commands in order to Deactivate or Activate any new Value Added Services on your mobile phone. You can also try this SMS method - SMS “STOP” to 155223 to deactivate all such VAS subscriptions.